Two years ago, during Christmas, I met Brad Lidge at a casino in Vegas. My family and I were having a little celebration and gift exchanging. I look over at the other table and there was Brad Lidge. Brad must have still been there since the Winter meetings. He looked lonely, so I invited him to join in. 5 minutes before the secret santa, I ran to the gift shop, and got Lidge a MGM Grand T-Shirt and a “Viva Los Vegas” snowglobe. He was surprised and embarrassed because he didn’t get me anything…. Until today. 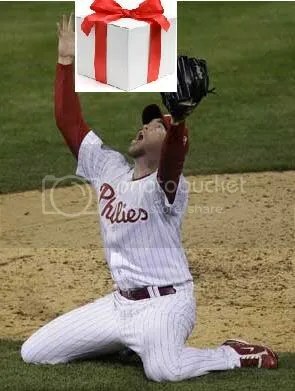 Ok. Well that didn’t really happen, but Lidge did give Braves fans a huge gift; A win, in the bottom of the 9th. I’ll be honest, I woke up at 6:00 Atlanta time, so I missed most of the game. I did see a couple of good plays. I was really impressed with Kenshin Kawa-Kick@ss nailing Ibanez at third. That definitly saved a run from scoring. Chipper got his wish. The Baseball Gods delivered for the Braves tonight. If you missed him call upon the forces, you can see it here. Nate McLouth re-aggravated his hamstring, something I called yesterday when I saw him run. Usually he runs always looking forward, with his elbows in a 90° angle, arms thrusting. Instead, he was looking back, and had on of his arms down to his side. Big problem. MFIKY (Soriano) is apparently injured. I have a hard time believing all these Braves injures. They’re always minor thing. 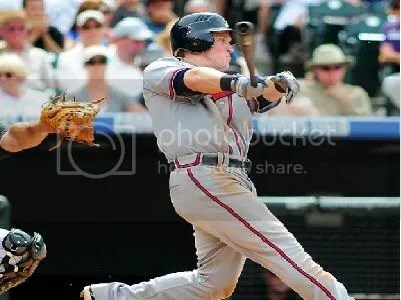 Kelly Johnson’s was definitely fake. He was out of options so FO put him on the DL and gave him “rehab assignments.” Kinda like sending him to AAA. Just watched the highlights; Garret Anderson made a spectacular catch and Escobar made an even better attempt to get out of his way. Good play. Here’s to hoping Nate and Raffy have a speedy recovery. Go Braves!! !